Over the past ten years I have moved several times. Although I now live in a house, our last property was a maisonette and I have lived in a couple of flats as well. Flats account for a high proportion of homes in the UK – about an eighth of residences in England alone. With the global population predicted to rise even higher in the next few decades, and city dwelling due to increase, it’s likely more of us than ever will be living in closer proximity to our neighbours in the near future. Flat insurance specialists Deacon Insurance have shared 10 weird and wonderful things about flats. During the first century BC, Rome’s success led to a massive growth in population. This made housing a challenge. The Roman’s combatted this by building higher, stronger structures. Using concrete, they were able to build reliable buildings quickly. Early multi-storey blocks, called insula or “islands” were much like the maisonettes of today, with roads surrounding the group of homes. In Milan, the concept of the Bosco Verticale (Vertical Forest) was founded by architect Stefano Boeri. 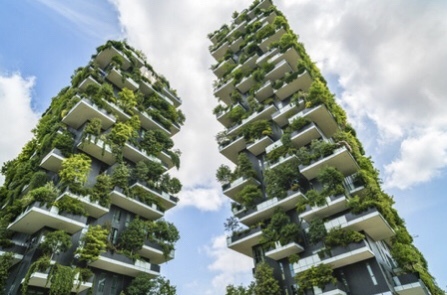 Now popular across the world, apartment buildings with trees and plants from top to bottom are not only visually impressive but also good for both the city and those living in the building. In 1934, before the second world war began, a famous actress called Marthe de Florian fled her apartment in Paris for the South of France. She never returned. When the building’s owner died in 2010, experts who were called in to assess the value of his estate came across a scene frozen in time. The flat was left just as it had been in 1934, untouched. Not just the stuff of science fiction. The world’s first shape shifting, rotating tower block is due to be finished in 2020, according to architectural firm Dynamic Group. In inner cities of the UK, recycling projects are seeing familiar building saved from demolition or neglect by being converted in flats. The original character and features preserved, buildings include Battersea Power Station and the Hoover Building in London. The popularity of urban ‘loft apartments’ in prime city locations means the trend is likely to continue. You may have been in the situation before, when viewing a flat near a railway line, where the noise of trains going by may be a dealbreaker for you. Imagine living in the block of flats in Chongqing, China, where a railway line goes straight through the building itself! 7 Tallest, Smallest, Largest – Where in the World? The tallest skyscraper in the world is currently the iconic Burj Khalifa in Dubai, which stands at a staggering 72 metres high. However, that is set to change. In 2020, the 1000 mile high Jeddah Tower, complete with serviced apartments, is due to claim the prize. In the Chinese city of Wuhan, population concerns have led to the construction of tiny 50 square feet apartments built for two. The largest building is the Copan Building in Sao Paulo. This 38 storey residential building has over 1,160 apartment units, and home to over 5,000 residents – impressive! 8 Going Underground and Underwater? Not one for claustrophobia sufferers like myself, architects are looking into the possibilities of building down rather than up. Concepts for a 35 storey upside down pyramid in Mexico City are still on the drawing board due to a whole host of practical and structural challenges that would need to be overcome, but with 70% of the earth’s surface covered by water, underwater cities may not remain the stuff of sci-fi for that much longer. Aequorea, a visionary city to be built off the coast of Rio de Janeiro, has been proposed. Anybody who has lived in London won’t be surprised to hear that the city ranks no.2 in the world for the highest cost of a city centre flat, second to Hong Kong. MSN Money looked into the different costs of living in UK cities, discovering that you would need over £7000 a month to live comfortably in the capital city, with Brighton, Oxford and Edinburgh close behind at £5,000 and places further out like Southampton still costing around £3,000 a month. The UK’s most expensive flat was valued in October 2018 at £160 million. The addresss? Hyde Park, London – of course. It is surprising that, in this day and age, it is possible to lose your flat, being left with nothing if you break terms of a lease or don’t pay service charges but this can happen, even if you have being paying a mortgage for many years. The feudal practice stems from the system developed following the Norman conquest in Britain, where the right was granted to lease the land and take income from this. By the 16th century, this law of leases was a confusing system. The Law of Property Acts, brought in in 1925, worked at limiting ownership to freehold or leasehold, and is still around today. Freehold covenants only define what you cannot do, whereas leasehold also say what you must do, such as paying for the upkeep of an asset owned by the freeholder. Scotland has a different system, where no duty to pay ‘feu duty’, similar to ground rent, could be set up after the mid seventies, and a residential lease of over 20 years cannot be created. Feudal structuring was abolished in Scotland in 2004 and laws since have meant that leases over 175 years have been converted into straightforward ownership.